How to Convert Prezi to Video Effectively with Decent Methods? Ever since PPTX became the default presentation file format for PowerPoint 2007 and newer, questions upon PPTX file playback have been flocking into Microsoft’s community. There are quite a lot of questions like: "How can I play my PPTX presentation on the school computer with PowerPoint 2003 installed?" "How can I view PPTX file on my iPad 4?" "How can I share my PPTX slideshow on YouTube?" Actually, it’s quite simple to solve these PPTX file playback issues. If you want to view PPTX files on your iPad or school computer, just install Microsoft PowerPoint Mobile or upgrade your school computer’s PowerPoint to the latest version. But if you want to upload PPTX to YouTube, you then need to convert PPTX to MP4 or FLV for YouTube. This guide would show you how to convert PPTX to MP4 file so as to let you freely make use of PPTX files for diverse purposes. If you’re familiar with Microsoft PowerPoint, you may know that since MS PowerPoint 2010, Microsoft has added an additional feature – "Create a Video" option. This new feature allows users to export and save PowerPoint to video in either WMV or MP4 format. This means that you could directly open your PPTX file on computer and then make use of this new feature to convert PPTX to MP4, without need to download third-party PPTX to MP4 converter software apps. Open your PPTX file in PowerPoint and then move mouse to and click the "File" menu at the top-left corner. On the drop-down menu panel, click the "Export" tab and then choose "Create a Video" option. You will then see a PowerPoint to video converting settings panel, including: 2 drop-down menus and slide duration settings. 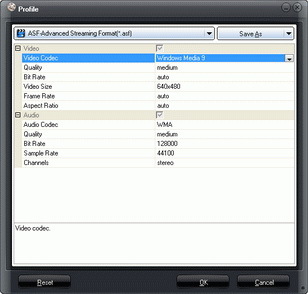 In the first drop-down menu, select output video resolution (target player to play created video) and size. In the second drop-down menu, select to include or exclude any timings or narrations you prefer. After this, set the time value and then click the "Create a Video" button. 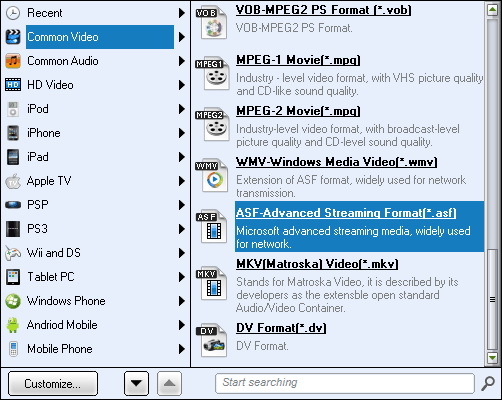 On the popup "Save as" interface, set output video name and determine MP4 as output format from MP4 and WMV. Also, determine a folder to save output MP4 video file. Click "Save" button. The MS PowerPoint would start to export and convert PPTX to MP4 file immediately. Microsoft PowerPoint allows you to convert PPTX to MP4 free. 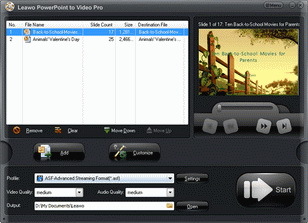 Besides PowerPoint program, you could also turn to online free PPTX to MP4 converter to convert PPTX to MP4 online free. You could directly visit Free PPTX to MP4 Converter Online to convert PPTX to MP4 online free. Open this free online PPTX to video converter page. Click the "Select a file" button to browse and add source PPTX file. After adding source PPTX file, you could view the PPTX file size and name. Set output video quality under the "Quality", select output video format (choose MP4 Format (.mp4)) and determine the video size(resolution) on the right. After settings, click the "Convert" button on this page. After converting, you could download the converted PPTX files (now in MP4 format) to your computer. Thirdly, the online free PPTX to MP4 converter is not stable. I have tested several online free PPTX to video converters only to get multiple errors on the screen. Different from these two apps, a desktop PPTX to MP4 converter could not only convert PPTX to MP4, but also enable you to determine the video and audio parameters of output MP4 file according to your target device and player. What’s more, with a desktop PPTX to MP4 converter, you could convert PPTX file to MP4 video in batch. Leawo PowerPoint to Video Pro is the best PPTX to MP4 converter software to help you carry out PPTX file to MP4 video conversion. It could convert all PowerPoint files to 180+ video formats for multiple purposes, like: PPTX to MP4, PPT to AVI, PPT to MP4, PPTX to MOV, PPT to MOV, PPTX to AVI, PPS to MP4, PPSX to MP4, POT to AVI, etc. ☉ Adjust video and audio parameters of output files for multiple devices and players. 1. 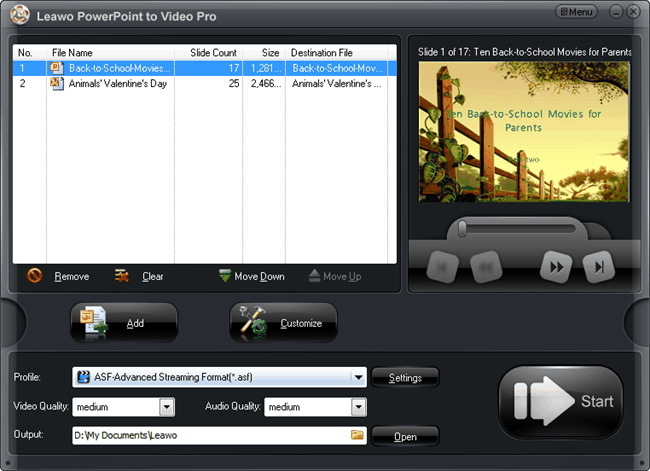 Convert PPT to video/audio in 150+ formats, including: AVI, FLV, MPEG, MP4, TS, MOV, WMV, VOB, MKV, MP3, AAC, AC3, WAV, etc. 2. Accept different PPT files, including: PPT, PPTX, PPTM, PPS, PPSX, POT, POTX, POTM etc. in PowerPoint 2000/2002/2003/2007/2010/2013. 3. Customize PPT files before converting: set PPT transition time, insert background music, set audio effect, set aspect ratio, add watermark, etc. 4. Set video codec, bit rate, frame rate, video size (resolution), aspect ratio, channel, audio codec, audio bit rate, audio sample rate, channel, etc. Run Leawo PowerPoint to Video Converter Pro on your computer, and you will see the main interface of the program. Click the "Add" button to import the PowerPoint file into the software. You could add multiple PPTX files into this PPTX to MP4 converter. 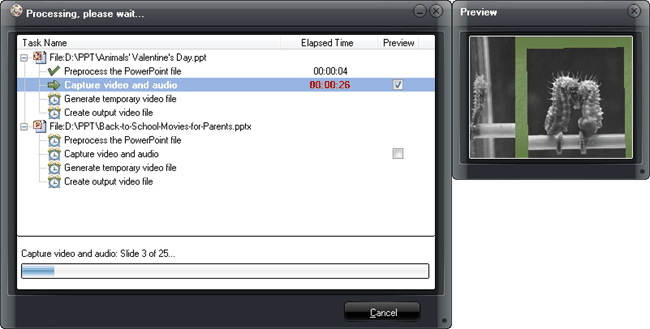 After adding the presentation, click the drop-down "Profile" box, navigate to set "Common Video > MP4" as output format. Click the "Output" box to select a folder on your computer as output directory. (Optional) Depend on the target device or media player you want to play PPTX files on, click the "Settings" button to adjust video codec, bit rate, video size, aspect ratio, frame rate, audio codec, channel, etc. (Optional) You can click the "Customize" button to edit PPTX files before you start to convert PPTX files: set PPTX transition time, add PPTX background music, adjust audio effect, change aspect ratio, apply watermark, etc. Finally, click the "Convert" button at the bottom right corner to start converting PPTX to MP4 video. You then only need to wait for the conversion finished. After conversion, you are able to transfer the converted PPTX files to your device or upload to YouTube with ease. How to convert PPS to MPEG ? How to Convert PowerPoint(PPT) to MPEG? 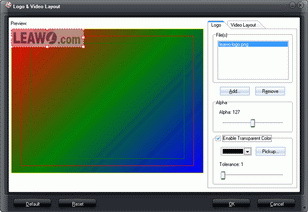 How to Convert PPT to WMV with PPT to WMV Converters?